We love checking out the Liberty Science Center with the kiddos but after hours the museum transforms to LSC After Dark where guests 21 and over are invited to explore the building and enjoy drinks, food, music, exhibits, dancing, and more. 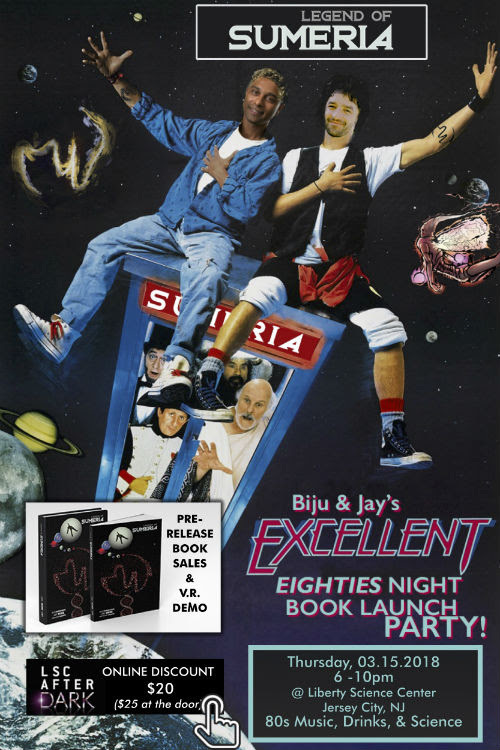 This Thursday, you can travel back to the 80s for their Liberty Science Center After Dark 80s Dance Party and Legend of Sumeria Book Launch! Join Biju Parekkadan, PhD, and Jason Webb, the creative minds behind the Legend of Sumeria graphic novel series for a live conversation and VR experience of the Legend of Sumeria world. While you’re there, you can also create your own ‘80s-style video game, learn how to master the Rubik’s Cube puzzle, and moonwalk on the dance floor with DJ Dancing Tony! Midnight Market NJ also returns this month with delicious snacks from local food vendors. And of course, it wouldn’t be an ‘80s party without an ‘80s laser show in the Jennifer Chalsty Planetarium and LSC Giant Dome Theater, the largest and most technologically advanced planetarium in the Western Hemisphere!